Sometimes, scientific truth can be so simple and beautiful that it is best represented as art itself. 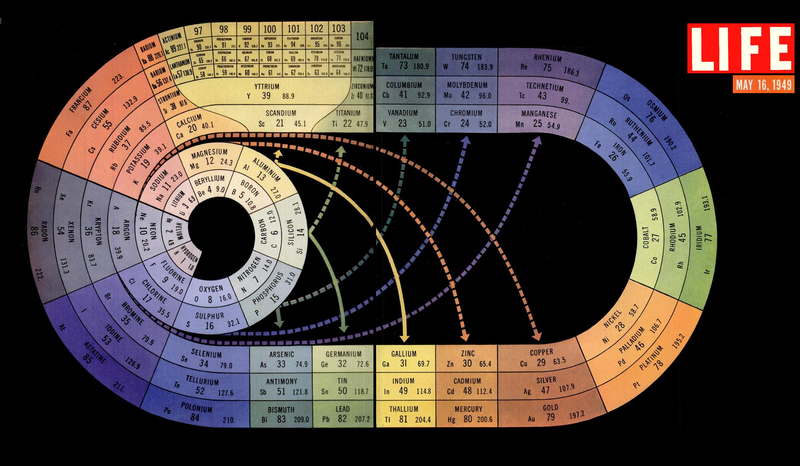 The feature photo, which is soon to become your desktop background, is one of those pieces of art; the periodic table of elements as a ovoid chart of similar elemental qualities from a Time Magazine article in 1947 . Working in space outreach, I get to see and create a lot of art designed to inform and inspire the exploration of our universe. I think this blog is the perfect place to share these one of a kind pieces. LEGOS: Speaking of one of a kind pieces, I’d like to show you this amazing video of AmputeeOT building a prosthetic leg from Legos. As the video description states, it was done on a dare from one of her co-works. That will teach them to dare her! Go AmputeeOT! Check out her other videos and awesome tattoos on her YouTube channel. CLASSICAL MUSIC: Keeping on our art theme, lets take a jaunt into the realm of classical music and bar graphs, with this absolutely mind grabbing visual representation of the 2nd movement of Beethoven’s 9th symphony. Let me know if everything keeps sliding to the left when the video is over. If you enjoy it there is a lot more on Smalin’s channel, including the entirety of the 9th. MORE UP GOER FIVE: Some of you may remember XKCD’s Up Goer Five comic. If not, here it is below. The reason I showed you this is to introduce a blog post by Bill Dunford on the Planetary Society’s website. In this blog you will find a video tribute to the Saturn Cassini mission done in the Up Goer Five style. It really is worth your time and I can’t wait to show it to my own little one. If you made it all the way to the bottom, you deserve a prize. Here is the song of the week, Deadmau5’s Faxing Berlin, arguably the song that started it all.